All that Christmas and New Year stuff is behind us and we drive, full speed ahead, into 2014. And our vehicle of choice is a cross between a stretch limo and a country bus. There are plenty of potential prompts to be found in this image which comes from the collection of the Royal Australian Historical Society on Flickr Commons : cars, buses, dams, men in white coats. As usual, all you have to do is to post a post based around an old image on or around Saturday 4 January 2014 and then link that post to the Linky List below. Try and visit as many of the other people posting as possible and thus keep the Sepia Bus moving. Here is a look ahead at the theme images for the rest of January so that you have plenty of time to plan ahead. 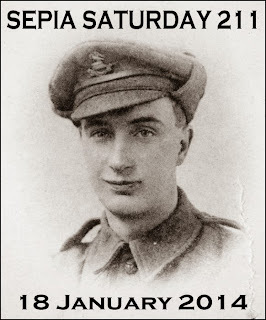 210 : Old photographs hidden away in a book. 211 : A soldier from the Great War - 100 years after the event. 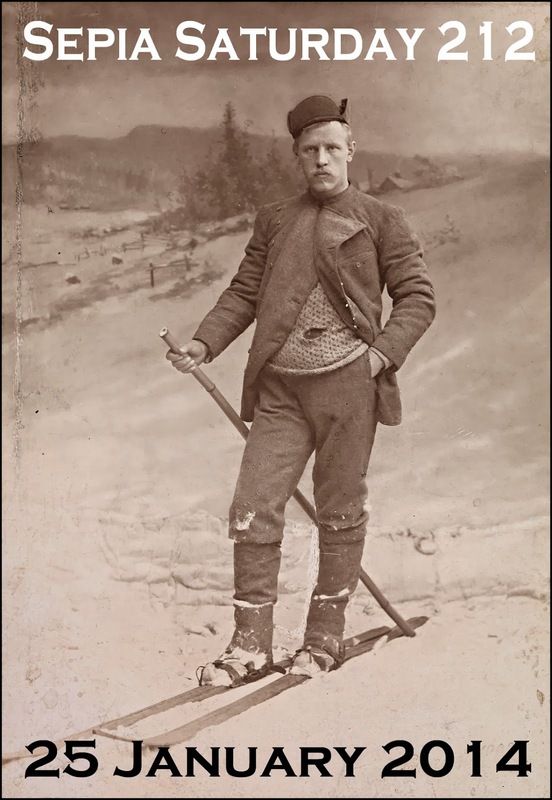 212 : Let it snow and get out those skis. You might like to think about those future calls whilst you wait for the bus. But don't wait too long, there it is, coming around the corner. 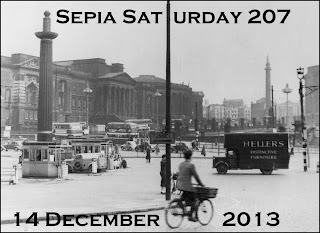 Welcome to the Christmas and New Year edition of Sepia Saturday. By tradition we relax the rules (what rules?) for posting over the holiday season and just ask you to post your post and link it to the list at any time over the next couple of weeks. For the "themers" amongst us we also give you the widest possible interpretation of the seasonal theme. 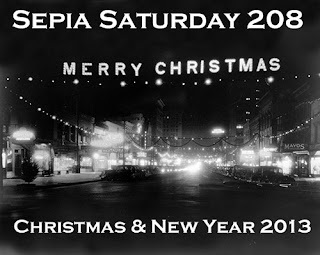 In effect, what our Christmas and New Year edition of Sepia Saturday does is provide you with the opportunity of sending out a Sepia Christmas Card to all your fellow Sepians, and the time and opportunity to get around every Sepian to wish them Seasonal Greetings. 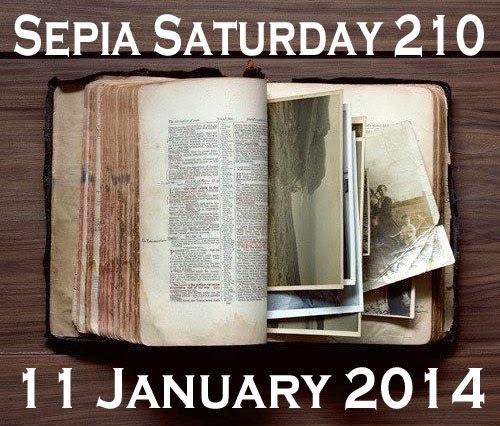 Our normal weekly calls will resume with Sepia Saturday 209 on the 4th January. Here is a quick preview of the next two Sepia Calls. 209 : By now, you don't need any suggestions from me. Search the image and find your own theme. That is it. That was 2013. 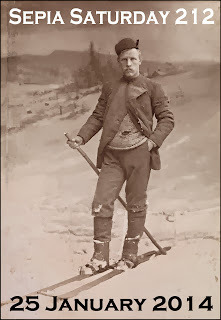 I like to think it was a good Sepia Year, we had some great themes and some fine posts. And we had our 200th celebrations and our own special book. Let us hope that 2014 is as enjoyable and creative. 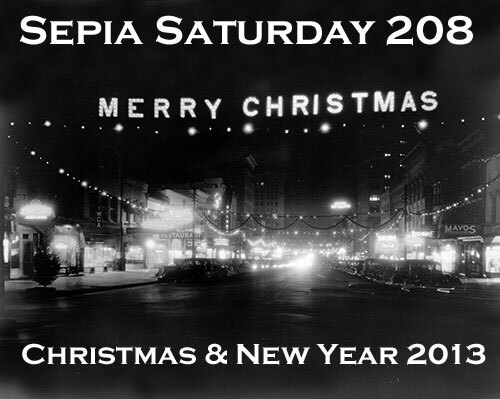 A very Happy Christmas and a Wonderfully Sepia New Year to you all. This is a picture of Liverpool which I found on a CD of copyright-free archive images. What I like in particular is how it ignores all the golden rules of photography : there is a strong vertical lamp-post dividing the image in two, your eye is not guided around the image by the composition but invited to take a running jump off the edge and for good measure, the central feature of the image - the cyclist - is out of focus. But what it reminds me of, is the fact that here on Sepia Saturday we don't celebrate great photographs, we celebrate great history. So it is time to bring out more of your curiosities, the odd compositions, the crimes against perspective, the thumb in front of the lens. If you come from a long line of great photographers, you could always concentrate on monuments, cyclists, removal vans, or the tunnel which is just to the left of this photograph. The choice is yours - there are few golden rules of Sepia Saturday. Just post your post on or around Saturday 14 December and then link it to the list below. 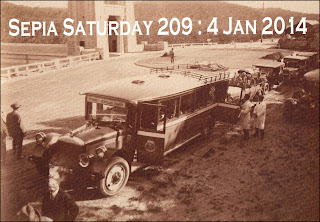 Christmas is around the corner and we have a Festive Sepia Fortnight for SS 208, whereas the regular weekly schedule returns with SS 209. Here is a quick preview of what is in store. But that is all in the future. Concentrate on Sepia Saturday 207 for now. Get things in balance and maintain your focus and avoid tunnel vision at all costs. 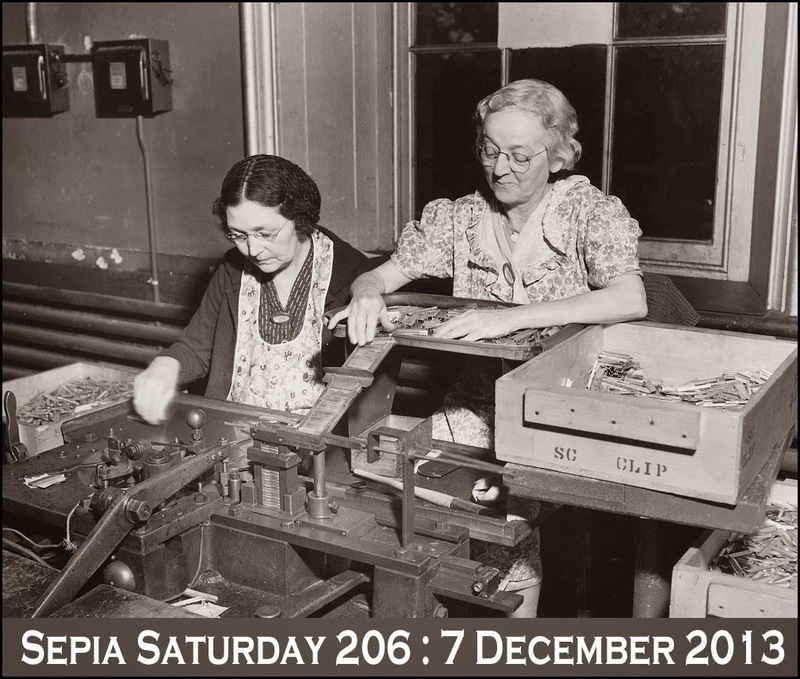 For Sepia Saturday 206 - post your posts on or around 7 December 2013 - we are celebrating that great domestic institution : the apron. They can be flowered aprons, aprons dusted with bread flour, gear-oil coated aprons or any kind of apron you care to show us. Our theme image is called "Mother Of The Assembly Line" and comes from the Flickr stream of the US National Archives. 207 : Photos with strange compositions, passing cyclists, removal vans, tunnels (look carefully there is one there) - the choice is up to you. 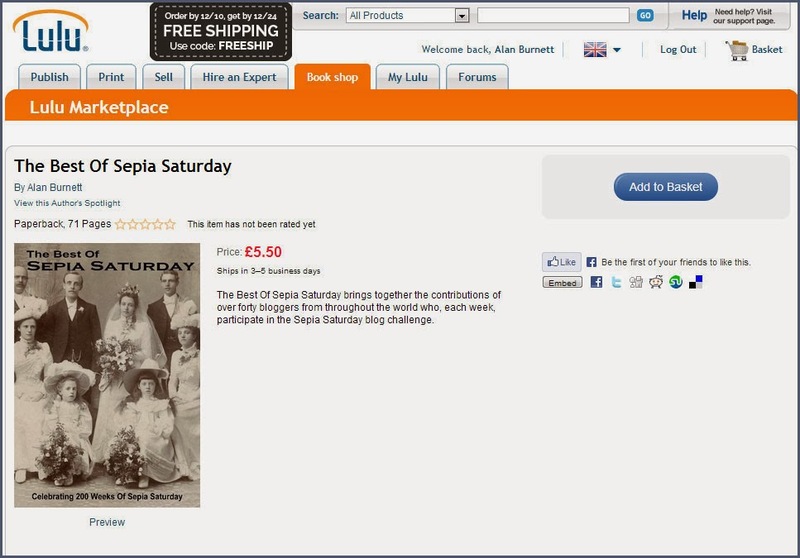 Before you go off to get your aprons, don't forget that the "Best Of Sepia Saturday" is now available. What better present to find beneath the tree on Christmas morning. So here it is. At long last. Hot from the sepia presses! 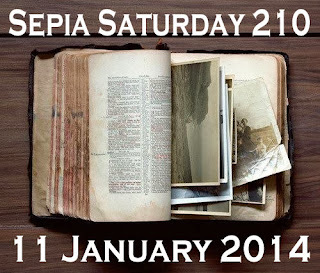 The Best Of Sepia Saturday is now available. It has been published via Lulu books which means that it can easily be purchased from Lulu on-line stores in the USA, Canada, Australia, the UK and a host of other European countries. You should be able to get to the product page by following this LINK. You can get a preview of the first few pages of the book by clicking on the preview button. You can change from the UK store to other national stores by clicking on the little national flag icon. At this stage, the book is just available in the black and white edition (with full colour covers) : unfortunately a colour edition isn't available in the format we are using, so to produce a full colour edition will mean quite a bit more reformating - and a substantial increase in the price of the finished product. But given the nature of the subject, I think the black and white edition looks quite good and is reasonably cheap to buy. If there is enough demand for a full colour edition we can revisit it as an option. At the moment, the book is only available direct from Lulu, but within the next week to ten days I will have completed the various checks to make it available via Amazon and Barnes and Noble worldwide. I will update you with progress on this as it happens. Try as I might, I was unable to make the final product genuinely profit-free (it would have complicated things no end and resulted into a complex price) and therefore I stand to make a few pence profit on each copy sold. If it is OK with you I will use any profits generated to go towards paying our Annual Linky fees. So there we are. I hope you like it. I apologise for the delays and for the mistakes I suspect there might be in the final text. I will be officially launching the book by lifting a pint glass of ale at 9.00pm (GMT) this evening. I invite all my fellow contributors to join me at the virtual book launch party. Thanks to you all for your support, encouragement and kind words. In particular, thanks to Marilyn for reading through the draft and spotting some important mistakes.